Just in time for the launch of the USTA's Quick Start Tennis Program for the sport's youngest players, David Minihan has authored Coaching Your Tennis Champion as the perfect companion to this new program. David Minihan is an award-winning teaching professional who is the Director of Tennis at the Westwood Tennis Center. He uses his experience as a teacher -- and a parent -- to bring a simple coaching plan that the professional and non-professional can understand. 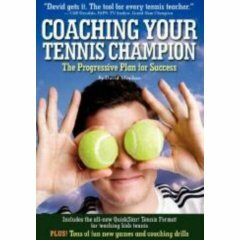 Coaching Your Tennis Champion is a detailed map to the Quick Start Program that includes games, drills and specific lesson plans. It is a great book for both coaches and parents to refer to in order to keep even the youngest players entertained on the court while they are also improving their skills.